Every now and then, I forget how much I like my son. I love him more than anything. It’s the liking that I sometimes lose track of. Before you start thinking I’m a horrible mom, let me explain. In the scheme of things, I sometimes get so bogged down with work, keeping the house clean, teething and crying, and just surviving in general. I do what I need to do with Robbie to get through the day and don’t always get to spend a lot of extra time just playing. Not today though. Today was all about Robbie time. We woke up around 7:45, and Robbie and I cuddled up in bed to watch A Muppet Christmas Carol, an important family tradition. He looked at me, impressed and wide-eyed, as I said the lines while they happened on the screen. He laughed hysterically when I sang along with the songs. I think he’s really going to appreciate the finer qualities of film. This afternoon, Justin went to a Bruins game with the Silletto men, and Robbie and I went on a play date. He went crazy playing with Max, Noah, and Pete; the four boys ran around like mad men. 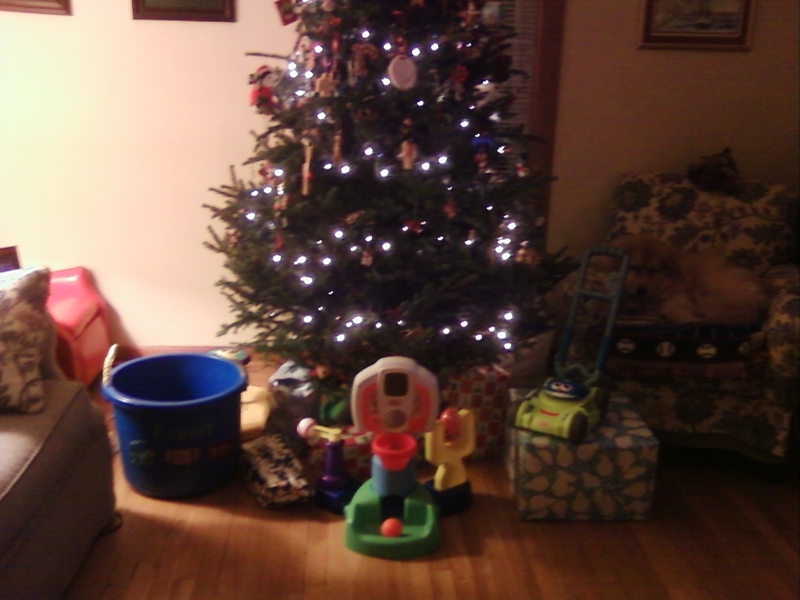 They dumped toys out of bins. They climbed in the bins. They bounced around. They had the time of their lives. And the moms all finally got a chance to catch up. It turns out that all of our sons have lost their minds. They’re throwing tantrums, sleeping erratically, refusing to eat foods that used to be their favorites… You know, being boys. It’s so nice to know that I’m not alone or raising a brat. I think the real “liking” came tonight when we finally got home from our play-date-turned-dinner. Robbie patiently waited while I booked a grooming appointment for the dog and talked to a sick friend. He stood in front of me, while I sat on the rocking chair, with his head on my knee. He smiled up at me while I rubbed his head, melting my heart. When I finally got off the phone, Robbie climbed up into my lap and asked for “wawa” for the first time ever. He snuggled in while I read Trucks Roll, the book he picked out for tonight. Once it was over, he cuddled in a little closer and looked up at me. We made googlie eyes for a little while, and he pointed to my eyes, nose, mouth, teeth, and tongue – wanting to know what each was. And, before he fell asleep, he was able to say and point out “eye” and “nose”. It was hard to put him to bed. I love those nights where he wants to cuddle a little longer. Time slows down just a little bit and everything else that I have to do doesn’t matter so much anymore. But, eventually, it’s time to go back to reality. I got the house picked up, groceries organized for cookie baking, and presents wrapped and put under the tree for the Manna family Christmas tomorrow morning. I’m ready for another day with Robbie and promise to make the time to really enjoy his company instead of just moving from one thing to the next so quickly. It was Christmas at daycare today! I wish I’d known; I would have sent cookies or something… Or not because we were up late finishing the Christmas cards last night. Anyway… Chinese Christmas is something we look forward to at our house every year. This year was a little more exciting because Robbie was actually aware of what was going on (instead of his five-month-old self that just smiled with drool pooling on his bib last year). He came running to the door this afternoon, carrying his Christmas prize: a stuffed Santa that he picked out himself (Addie also chose the Santa, while Luke chose the “flake” – translated, this means “snowman”). Zhining also gave us what is sure to be my new favorite Christmas decoration (previously a mouse house made for me 30 years ago by my babysitter). 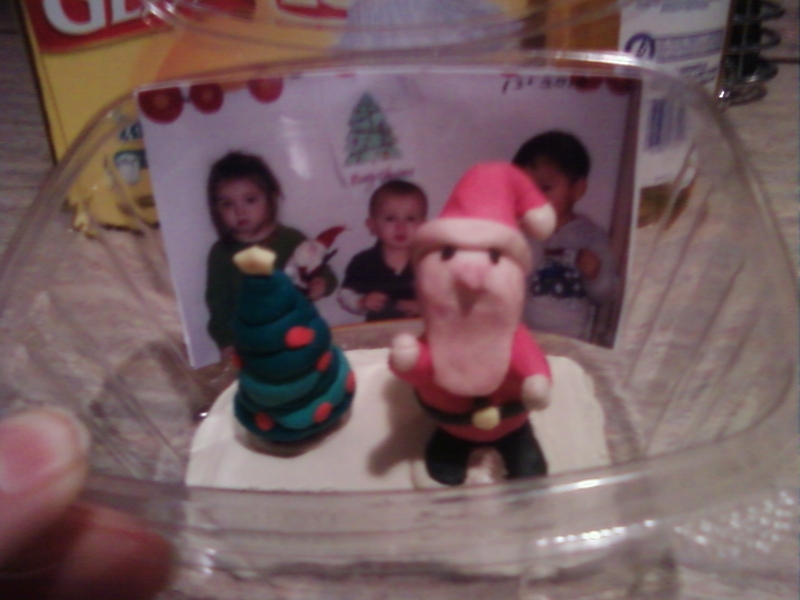 She makes figures out of clay, and she created a Santa and a Christmas tree. They are set up in a clear box with a picture behind them of the kids in daycare. She also put in a picture of Robbie running around a tennis court this fall because that was an important thing that happened this year. It means so much to me that Zhining devotes so much of herself to QiQi. She made a Christmas gift bag for the whole family, including two “balls” (oranges, Robbie’s most favorite food ever) and an assortment of Chinese food that QiQi loves (and Justin and I are developing a taste for). I actually look forward to some of the snacks now (she sometimes has an afternoon snack for me when I pick Robbie up). Zhining also included some pictures over the past month of Robbie with the other daycare kids. My favorite is of Robbie and Pete on tricycles next to each other. I’m sure everyone thinks they have the best daycare provider, and that’s important for you. But, we really do! And, since we have the daycare provider of the century (I know, you’d think it was a little early to call “of the century” in 2010), Christmas shopping for her is difficult. I don’t want to give her just cash; I want to give her something that shows how much we appreciate her, how vital she is to our lives, how much we love her (yes, even Justin!). A gift card seems impersonal. Zhining isn’t a frivolous woman, so I’m not sure that something like jewelry would work. I thought about pajamas because she definitely deserves some downtime, but that seems too personal. And, even though her job would drive me to drink, I don’t think she does. I guess I’ll just have to wander around stores aimlessly until the right thing hits me… Or until a creative reader posts a suggestion! Everything continued as normal: put hair in rollers, slip on fuzzy flip flop slippers, wear fleece UK robe, moisturize, let the dog out. It was the last one that got me. When I went back downstairs to let Barkley in, I noticed that the trash hadn’t been put out front. Being the good neighbor that I am (and the fact that most of the trash was ours), I decided to take it outside the fence. I planned to take it to the curb when I went to leave. But, since I was already there and already had my hands on the trash cans, why not just take them out now? Save myself time later. Right? I got the first can to the curb and came back to get the second one. I praised Barkley for being such a good dog and staying put. Then I took the second can out. When I looked up, I saw that Barkley had joined me. Suddenly, a sinking feeling took over. And Barkley started walking down the street. Quickly. Barkley continued walking down the street, undaunted for my calls and attempts at bribery (he was not interested in the recyclables placed intermittently down the street). He reached the corner and turned. At this point, a runner dashed past and laughed at my predicament. Barkley continued down the road at a good clip. When he reached the corner, he stopped and looked at me. I crouched down and, sounding as pathetic as possible, called my dog, who came running and nearly knocked me over with all his enthusiasm. In a moment of brilliance, I tied the belt of my robe to his collar and walked home as quickly as my frozen little feet could carry me. And learned to never take the trash out on a Thursday morning. Surely Robbie will be old enough to take the trash out on his own soon. Or Justin will remember that the trash comes on Thursday mornings and volunteer to take it out Wednesday night. Or I’ll just take it out when Barkley isn’t in the yard. Yeah, that’s probably it. Last Friday, I slept wrong and woke up with a horrible pain in my right upper arm. I expected (hoped?) it would go away with a good night’s sleep on Saturday. Unfortunately, I couldn’t get comfortable enough to have a good night’s sleep. Sunday and Monday night were more of the same. Well, not the same because it was worse. Last night, I almost cried as I tried to work my way through muscle spasms down my neck, across my shoulder, through my elbow, and straight down my back. Today I stayed home from work because I was unable to move anything on the right side of my body. I took Robbie to daycare for Justin, who was also under the weather. But I had to have Justin put the baby in the car because I couldn’t lift him up to put him in there. Luckily, he could climb down from his car seat and walk into Zhining’s house. Afterwards, I went to have the right side of my body “fixed”. It was one of the most painful experiences of my life. I nearly leapt off the table about three times. It turns out I had pinched something under my shoulder blade. It caused pain to shoot down my arm. Then, after three days of compensating for the pain, my entire right side cramped up. Now, even though I can move, I’m still sore. Zhining, ever concerned when something is wrong in our family, gave me something to help with that… It’s a Chinese ointment (liniment?) that she swears will make me feel better by tomorrow. Of course, since the instructions are written in Chinese characters, Zhining reminded me not to let Robbie play with it and not to ingest it. And, even better, she promised to bring me my own bottle when she goes to China next summer. I suppose it’s time to take off the Icy Hot (err… Walgreens Cold and Heat) patch, wrap my arm and shoulder in a hot towel for ten minutes, and rub the Chinese miracle on my shoulder and arm. Oh, and cross my fingers that it all works! Robbie has recently learned “no” and all the power that comes with the simple word. He’s known about shaking his head for a while now, but he wasn’t quite sure how to use it properly. Every now and then, he would just move his head from side to side. But now that he can pair it with a solid “no”, he’s unstoppable. He played the same game at dinner. “Do you want more chicken?” “No.” “Do you want more cheese?” “No.” “Do you want more milk?” “Yeah.” And again when we video chatted with my mom, and we asked him to blow her a kiss. “No, no,” with a big smile and shake of the head. I have a feeling we’re going to hear a lot of this word over the next few years… But at least he says it with a smile. Even a “no” is hard to resist with that smile and those eyes. I looked forward to this trip for over a month, and now it’s over. I have returned from the frozen tundra of Montreal to the soggy streets of Arlington. The trip didn’t go off exactly the way I anticipated; my friend Amy got horribly sick during the day Friday, so it was just Allie and me. We got into town around 11:00, checked into our hotel, and drifted off to dream sweet Canadian dreams. On Saturday, I slept later than I can remember sleeping in the past 17 months. I dragged myself from bed at 10:30 in the morning. The weekend was a great time: a cute cafe for lunch, shopping at the RESO underground, a new pair of red shoes, fireworks over the St. Lawrence, a search for good Christmas decorations, and a terrible and expensive buffet dinner at the hotel. But this morning? This morning I wanted to get home and see my little boy (and Justin, too). I wanted to hug him and cuddle him. Allie and I left around 11:30 because the snow was coming down pretty heavy in Montreal. Incidentally, they do not have excellent snow removal in Montreal. The streets were HORRIBLE. Luckily, we were able to get home safely in about 5.5 hours. 1. Border patrol employees do not have senses of humor. When they ask why you are going to Montreal, the correct answer is not, “To escape my husband and child.” When they ask if you bought anything, they don’t appreciate seeing the McDonald’s bag you just procured. 2. Canadians have highway signs for spas. They are stick figures giving a massage. The do not, however, have signs for gas stations. This is particularly problematic when your “low fuel” light comes on and the GPS only shows gas stations that are 15 miles the other way. 3. Canadians tend to walk in packs of four or six and take up the entire sidewalk. It is difficult to get around them because Canadians driving down narrow roads often pull up onto the sidewalk. Speaking of sidewalks, it is important to note that sometimes there are deep puddles of melted snow. For a lesson on how to avoid these, please ask Allie. She was not able to avoid them. 4. Canadians are extremely friendly and willing to speak English. We tried our best with the French, which I think was appreciated. However, we did find that the English-speaking was limited to Montreal. When we finally found the evasive gas station, we stopped for lunch. We were barely able to communicate enough to order an Extra Value Meal… Thank goodness I knew the word for “bag” (sac, in case you’re traveling to Quebec soon). Otherwise we would have had to carry our food out to the car piece by piece. 5. Red shoes at 50% off and the Canadian dollar are a terrific buy. I’m very excited to wear them tomorrow. I paid $20 Canadian. And Allie found a white wool peacoat for only $50. I probably could have done some more damage, but… You have to know when to call it quits. 6. When it sounds like fireworks, run quickly in the direction everyone else is going. You don’t want to miss the show! We didn’t know there were going to be fireworks, but the show over the St. Lawrence was pretty fabulous! 7. Sometimes, when you think about an Orange Julius, one will show up (that actually happened in Old Montreal; I mentioned that one would have been great while shopping, and there was an Orange Julius stand). 8. Canadian soft serve is different from American soft serve. It is much denser, and the chocolate has a lemony taste. This is where the Orange Julius came up; that seemed like better mall food than dense soft serve. 9. If you get caught making a right turn on red in Montreal, it will cost you $135 Canadian (so, approximately $134 US). 10. There are no Santa Clauses to be found in Montreal. And we looked. Maybe they just keep them above ground. There were none in the underground shopping, but there was a four-story Christmas tree. 11. There’s nothing like returning home. Unless it’s returning home to a baby who is thrilled to see you and comes running to you with a big hug. I’d imagine that would be nice. And maybe it’ll happen next time. This time, Robbie just wanted to rifle through my purse. I know this trip is going to be great. I’m already looking forward to the extra sleep for two mornings. And eating without worrying about feeding someone else. And not changing any diapers. But, boy am I going to miss that smile. And that laugh. And those hugs. And the occasional kiss when I’ve been a really good mom. I suppose those things will hold to Monday morning, though. And it’s only fair that Justin get a few of those things while I’m gone. I got Robbie changed into his perfect Santa outfit when I picked him up from daycare (an hour late because of professional development meetings). Justin met us there, and it was off to the mall. We stopped for Chik-fil-a for dinner, and I smartly left Robbie’s coat on and zipped up to prevent any damage to the perfect Santa outfit. Did you know Chik-fil-a gives a 50% military discount? Neither did I until after we placed our order… But excellent information to know for the future! We arrived at the North Pole, and Robbie sat up a little straighter in his stroller. It was like he could sense something momentous was about to occur. The line moved quickly, and, suddenly, we were at the front. Justin tried to pass Robbie to Santa, and the child turned into part spider monkey. He refused to let go of Justin. I finally managed to get Robbie, and we sat down next to Santa. The patient man handed Robbie a candy cane, which seemed to soothe him some. Miraculously, the lady snapping pictures managed to catch Rob between shrieks. Instead of being in a full-on scream, he only looks merely horrified at his situation. Being the good mom that I am, I tried to pick the one where he appeared to be in the most distress. 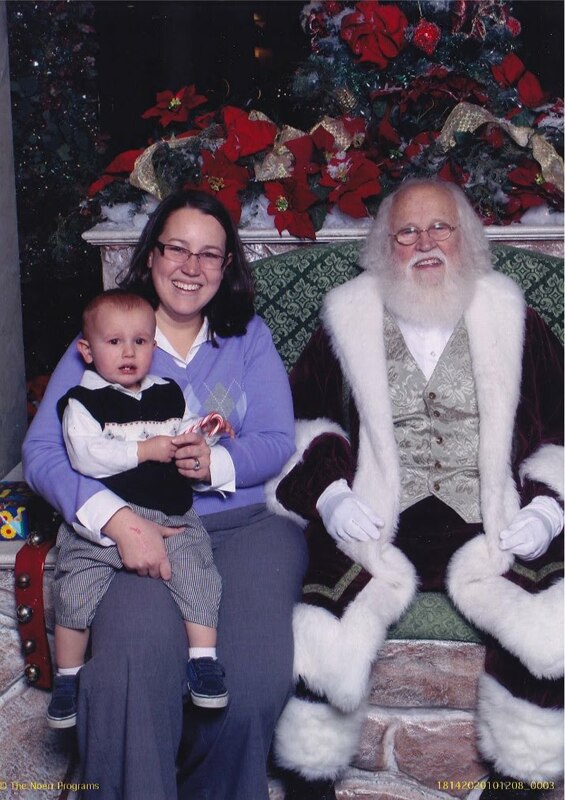 After all, if you’re going to have a bad Santa picture (crying child, mom without brushed hair or lipstick…), you might as well go all the way. Justin and I are considering going to Natick to the Santa we saw last year next week. I know it sounds silly, but I like the idea of having pictures of Robbie with the same Santa. The Christmas spirit was alive and well in Lawrence today, too. One of my favorite students stopped me in the hall today and told me he had an ornament for me. I wasn’t sure I’d heard correctly, but he pulled something out of his pocket. It was, indeed, an ornament. 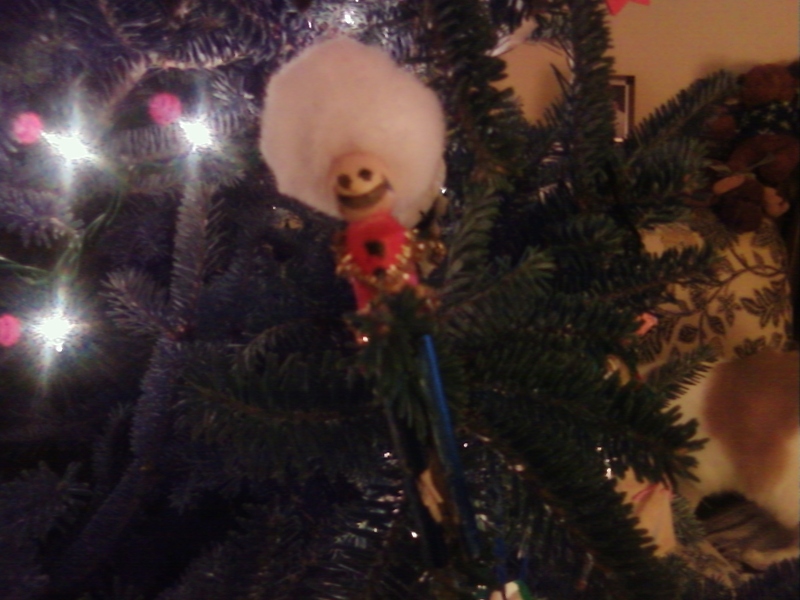 He had decorated a clothes pin to look like a nutcracker. I was so flabbergasted! Later, I asked my student what had caused him to decide to make this ornament for me (even now, I still have a hard time picturing him sitting down to make it, surrounded by clothes pins, paint, glittery pipe cleaners, and puffy balls for hair). He said his niece and uncle were making Christmas ornaments, so he decided to make one. Earlier in the week, I’d told my kids that I had a list of all the ornaments I’ve ever received with the names of the people who gave them to me. My students said he thought that was pretty cool and wanted to be on my ornament list. And he did make the list; it will be the first entry for 2010!